Are lower oil prices really a problem? What's the right price for gold? This post is practically a repeat of my post in April 2014, "Taking the measure of our discontent," except that I've updated the charts and the numbers and adjusted the commentary somewhat. It's appropriate and timely, since the GDP revisions released today show that the recovery has been even weaker than we thought. The Great Recession of 2008-2009 wasn't your typical recession. In every other recession in postwar history, the economy rebounded within a few years to return to its long-term growth path. But not this time, and it has nothing to do with the rich getting richer or the alleged increase in inequality. Instead, it has to do with the average person and the average family not making the kind of progress to which they've been accustomed. Understandably, people are upset. 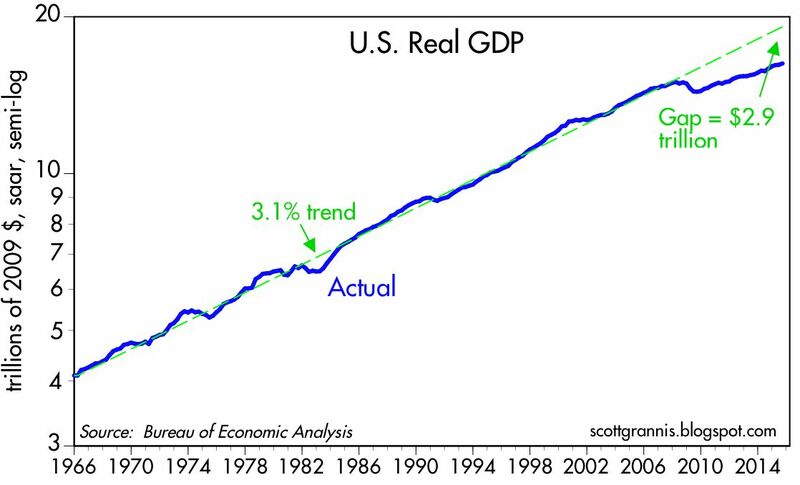 The chart above compares the actual growth of real GDP (blue) with its long-term trend of 3.1% per year. Never before has real GDP fallen below its trend by so much for so long—and still, as we are entering the seventh year of recovery, there is no sign of a true recovery. The current "gap" between actual GDP and its long-term trend is about 15% by my calculations. That translates into a national income shortfall of almost $3 trillion. This is the measure of the country's discontent: $3 trillion in missing income. 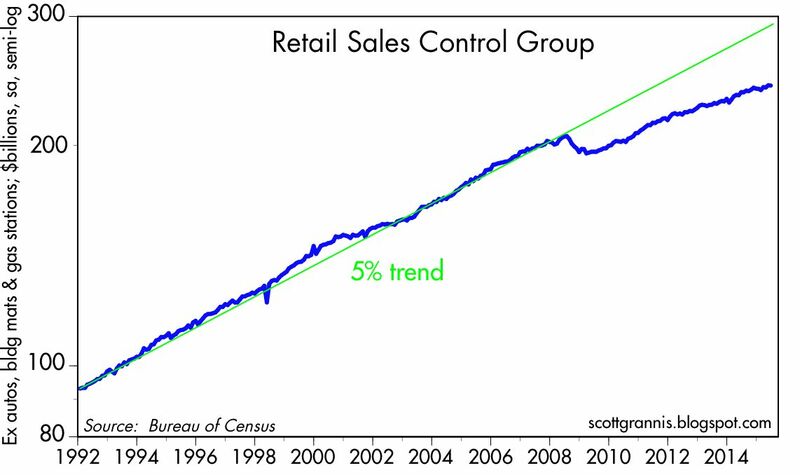 We see the same pattern in the chart above, which compares the actual growth of a subset of retail sales (which excludes certain volatile categories) to its long-term trend. These are the expenditures made by ordinary folk, not the mega-billionaires. This helps dramatize just how radically things changed beginning in the latter half of 2008. 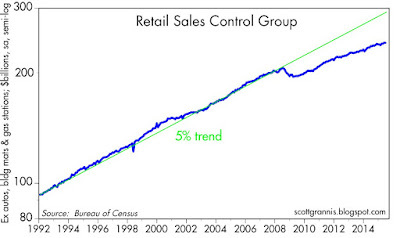 Retail sales by this measure would have to increase some 20% overnight to get back on their long-term trend path. This is a measure of how much middle class families are hurting. 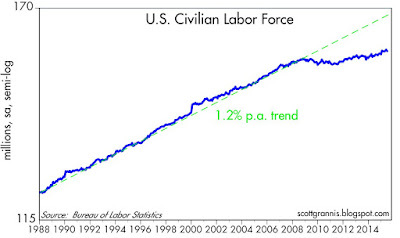 After growing for decades at about a 1% annual pace, the labor force suddenly stopped growing in late 2008, as the chart above shows. 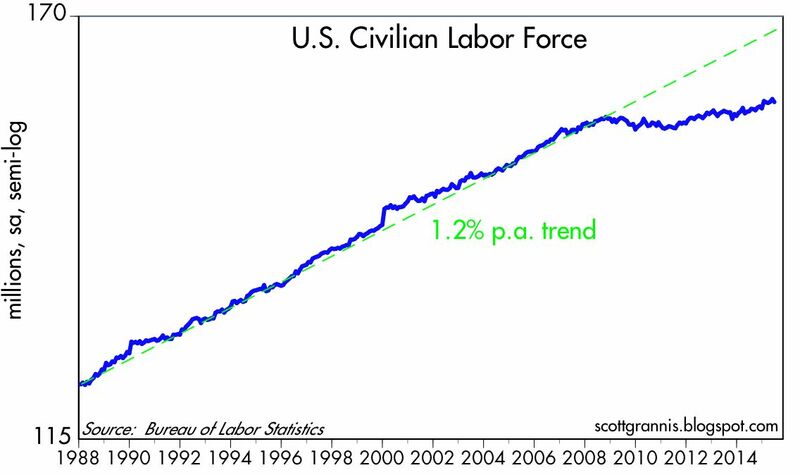 Things have picked up a bit in the past year, but the labor force is "missing" around 10 million people—people who have given up trying to find a job or who have decided they just don't care to work. If one thing stands out in these charts, it is the abruptness and the severity and the persistence of the divergence from long-term trends that began in 2008. Something REALLY BIG happened; what was it? It was not demographics, since demographics change at glacial speed. The population didn't suddenly got older and start to retire en masse in late 2008. The one thing that changed in a really big and durable way, starting in 2008, was fiscal policy. The Bush administration launched TARP in late 2008, and the Obama administration followed up with ARRA in 2009. Then came Obamacare in 2010, which purported to restructure fully one-sixth of the US economy within the space of a few years. Then came the Dodd-Frank super-regulation of the financial industry. Beginning in 2013, top marginal tax rates were increased. 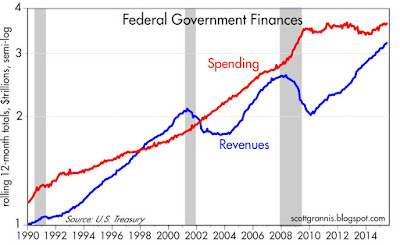 As the first of the above two charts shows, massive fiscal "stimulus" (aka deficit spending) increased the federal government's debt from $5.34 trillion in June '08 to $12.45 trillion as of this week. 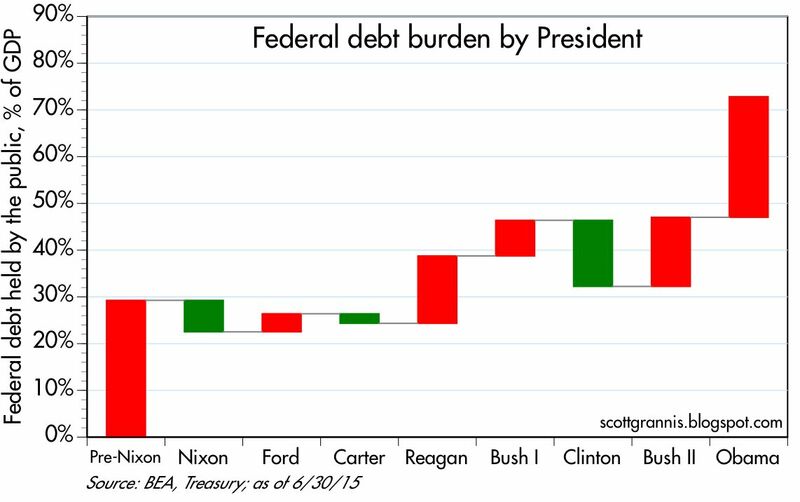 As the second chart shows, that surge of borrowing more than doubled the federal debt burden, raising it from 36% of GDP in mid-2008 to just over 72% of GDP in the span of seven years. The only other time something of this magnitude happened with fiscal policy was WW II. 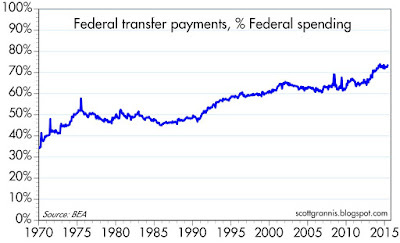 The federal government borrowed $7.8 trillion over the course of the past seven years and handed most of the proceeds out in the form of various transfer payments (which now make up over 73% of federal spending). Our leaders in Washington did this in the belief that this would stimulate spending and that would convince businesses to create more jobs. The federal government restructured the entire healthcare industry in the belief that this would lower costs and give everyone healthcare insurance coverage. The federal government rewrote the rules for the entire financial industry, in the belief that a more-highly-regulated banking system and greater consumer protections would restore confidence and optimism. And to top it off, the federal government increased taxes on the rich, in the belief that this would benefit the middle class by more fairly distributing the fruits of progress. But it didn't work. Spending wasn't stimulated; job growth didn't surge; healthcare costs continued to rise, the vast majority of the uninsured are still uninsured, and millions have lost what coverage they used to have; banks are reluctant to lend and consumers are reluctant to borrow; consumer optimism remains weak; and the middle class has taken it on the chin. If anything, the massive growth of government intervention in the economy since 2008 looks to be the Occam's Razor explanation for what caused the weakest recovery in history. If there is a reason for widespread discontent, it is our federal government and its overbearing and intrusive ways. Thanks to all the government "help" that has been heaped upon us in the past six years, we have the weakest recovery in history. And the bill for all this is a staggering $3 trillion per year and counting. As I mentioned last week, lower oil prices (and falling commodity prices) have given the markets a case of the jitters. 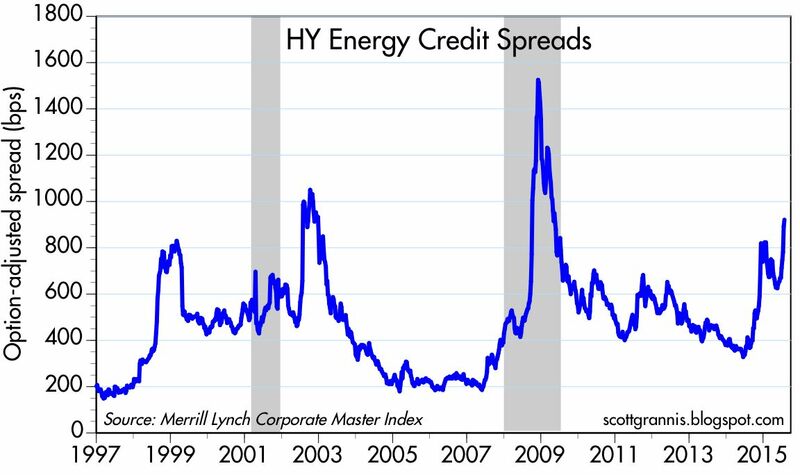 Default risk in the high-yield energy sector is up significantly, and this has sparked fears of a credit default contagion. It doesn't help that Chinese stock prices are extremely volatile (and currently falling) and that the Chinese economic powerhouse has slowed down measurably. But looking deeper into the numbers, so far there is no sign of any contagion; markets are still very liquid and systemic risk is low. Markets are very good at weathering storms as long as they are liquid. It's therefore likely that this storm will pass, as many others have in recent years. 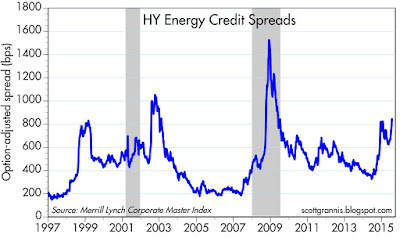 This chart shows the spread on high-yield energy bonds, which has spiked of late to a new post-recession high in response to the renewed decline in oil prices. The deterioration in the energy sector has spread somewhat to other sectors as well. 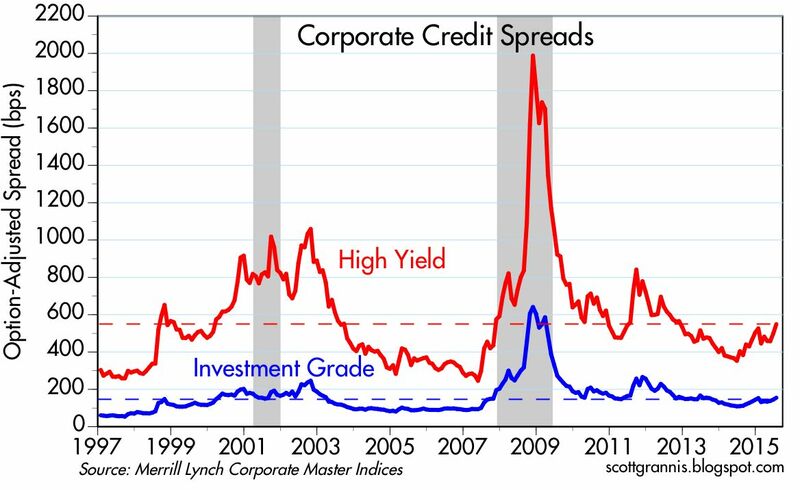 Investment grade and high-yield spreads in general are up, but only moderately. The damage is more or less limited to the energy sector. I've long touted the ability of 2-yr swap spreads to be excellent leading indicators, because of their ability to give advance warning of big problems in the economy. 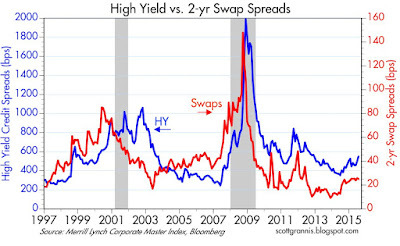 The chart above adds to the story, since it shows that swap spreads have indeed been leading indicators of high-yield spreads, and sometimes by a considerable amount of time. 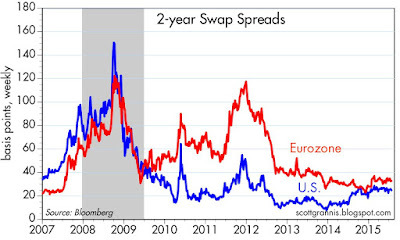 Today, swap spreads are trading well within the range of what might be considered normal: 20-30 bps. This tells us that financial markets are healthy, and that in turn is a good sign that there is no fundamental deterioration going on in the broad economy. It's an energy "crisis" of sorts that is bad for producers and associated industries, but good for just about everyone else. It's not the end of the world. It's hard to put complete faith in the economic statistics coming out of China, but according to the government, the economy is growing at about 6-7% per year. That's way down from the heady 10% growth rates which prevailed in the mid-2000s, but it's still pretty impressive—at least twice the growth rate of the most energetic developed economies. 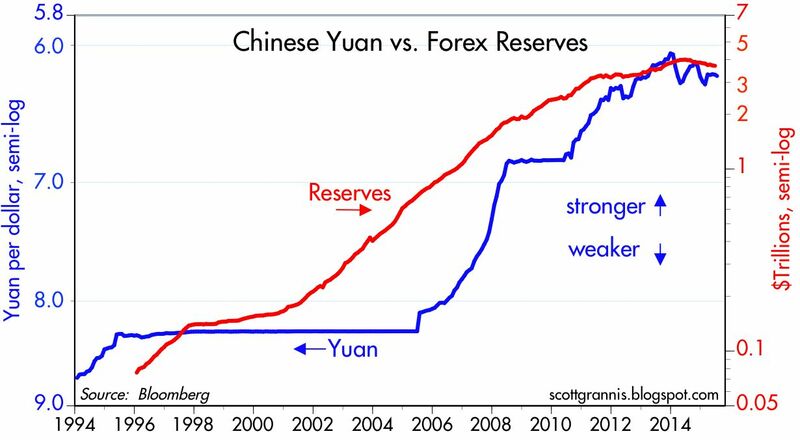 However, one number the government can't easily fake is the central bank's holdings of foreign exchange reserves, shown in the above chart. Forex reserves have been in a $3.5 - 4 trillion range for the past several years (most of it invested in U.S. Treasuries). 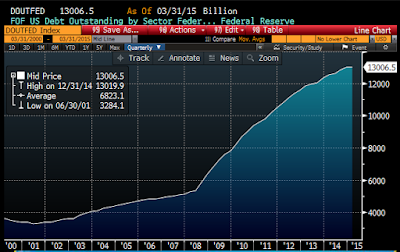 Over the past year China's forex reserves have fallen from $4 trillion to $3.7 trillion. Meanwhile, the yuan has been relatively stable against the dollar for the past 4-5 years. What this means is that capital is no longer flooding into the Chinese economy. 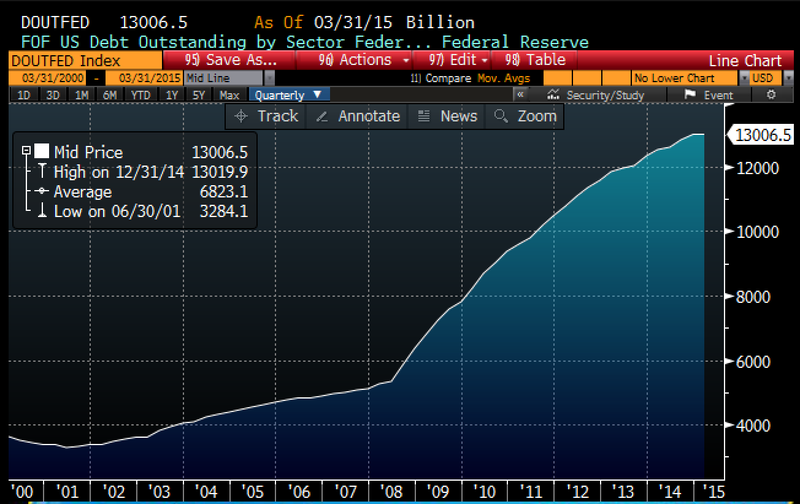 The rising tide of reserves—which lasted some 20 years—has reversed, with minor capital outflows of late. That squares with China's slower growth rate. The boom times are over; now, instead of extremely fast growth, China is experiencing simply fast growth. That growth is being financed organically, and China's growing and rapidly aging population is beginning to invest overseas, at it should. None of this is troubling, but it is a big change—a great inflection point—that will take some getting used to. UPDATE: A decline in China's forex reserves means that the central bank is selling some of its forex reserves in order to keep the yuan/dollar exchange rate stable. 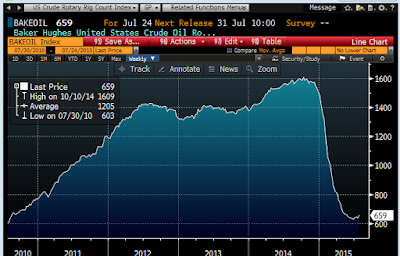 That in turn means China has been (and most likely will be) selling Treasuries. But what happens to the dollar proceeds of those sales? The dollars raised by the central bank's sale of Treasuries must, at the end of the day, be spent on something in the U.S., such as equities, bank savings accounts, real estate, tourism, movies, and assorted goodies. In other words, capital moving out of China means increased purchases of U.S. goods, services, and equities. Consider this post a public service announcement. 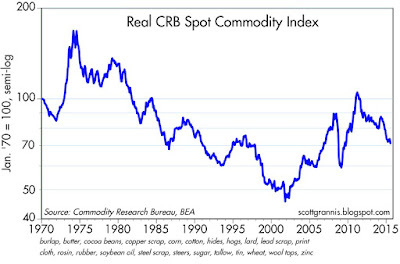 The objective is to put recent commodity price trends into a long-term, historical perspective. 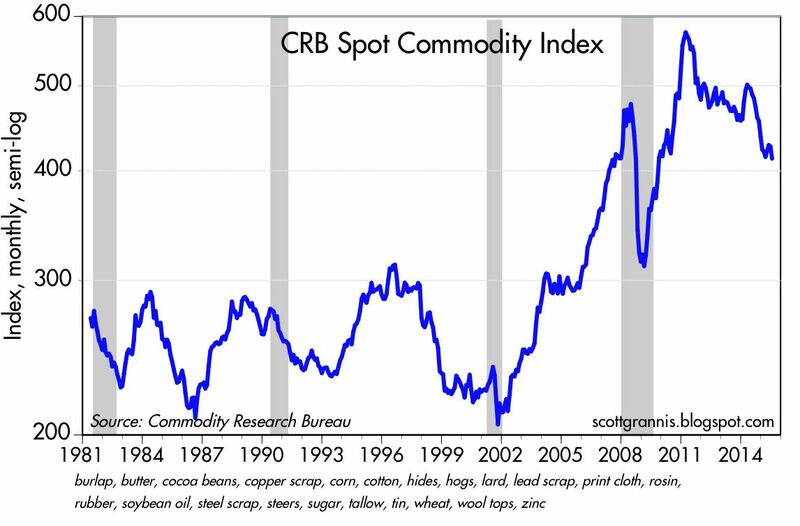 I think that what it shows is that despite significant declines in the past few years, commodity prices are still holding up quite well relative to where they've been in the past. We start the review with "Dr. Copper." 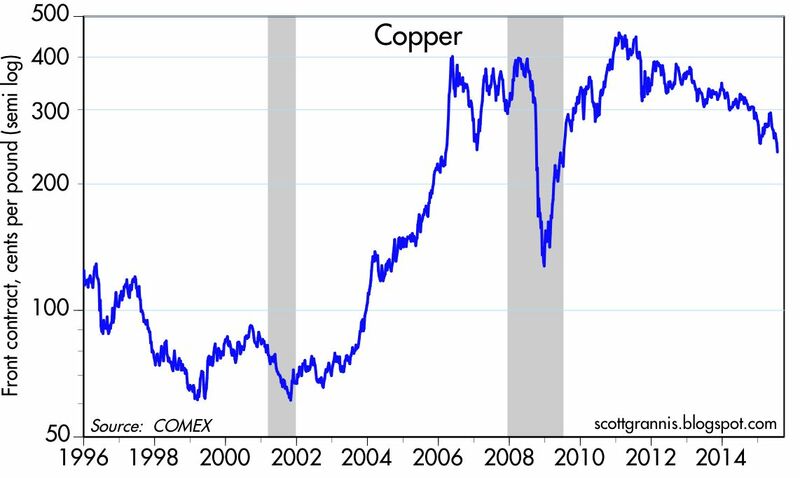 Copper prices have been extraordinarily volatile in recent decades. 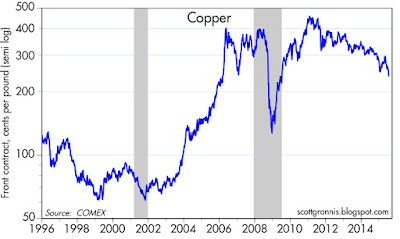 Copper has declined 40% from its early 2011 all-time high, but it is still 290% above its 2001 low. 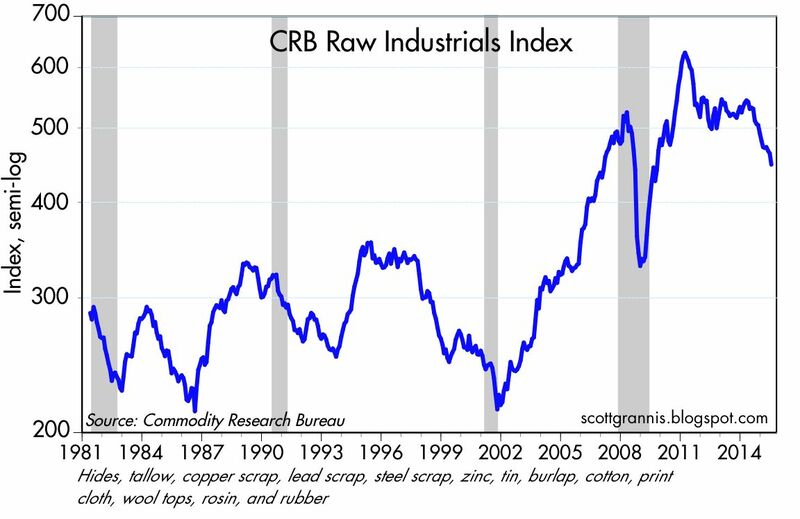 The CRB Raw Industrials index is my favorite commodity index. It doesn't include any energy or precious metals. It includes mostly just basic commodities of the sort that don't lend themselves to speculation or stockpiling. This index has fallen almost 30% from its 2011 high, but it is still almost 110% above its 2001 low. 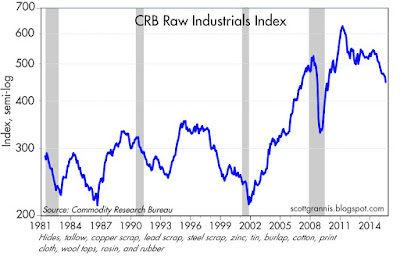 The chart above shows the inflation-adjusted value (in today's dollars) of the CRB Raw Industrials index. 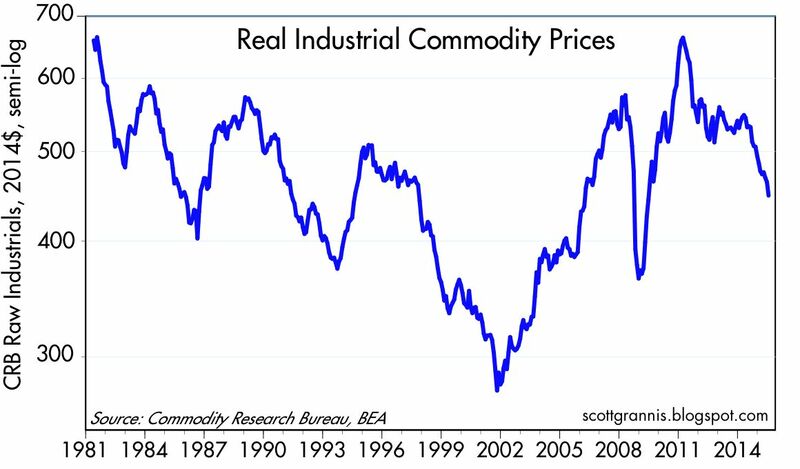 Here we see that despite the huge increase in commodity prices since their all-time lows of 2001, prices today are still about 30% below their early 1980s level in inflation-adjusted terms. I don't include prices going back to 1970 because the composition of the index changed, but most commodity indices show almost no change in real terms from 1970 to 1980. 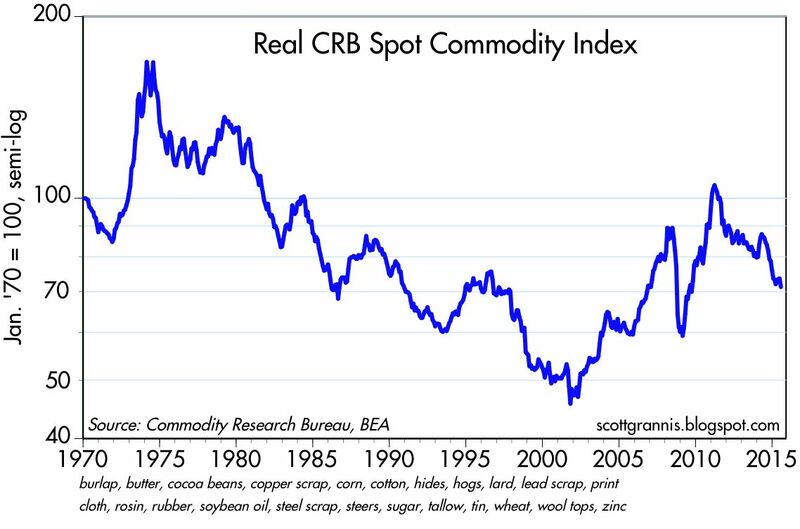 Similarly, commodity prices in the 1960s were largely unchanged in real terms. In the end, what becomes apparent is that commodities tend to become cheaper over long periods. Presumably that is because of technological advances in exploration and extraction techniques. This vindicates the late Julian Simon's view that the only scarcity that exists in the world is human ingenuity. There has demonstrably been no scarcity of commodities. 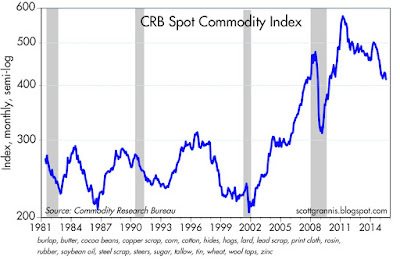 The CRB Spot Commodity index consists of the Raw Industrials index featured above, plus the CRB Foodstuffs index. After adding in notoriously volatile food prices, the picture remains essentially the same. 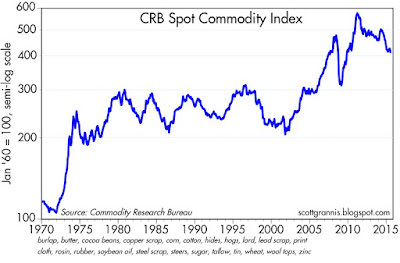 The chart above extends the CRB Spot index back to 1970. 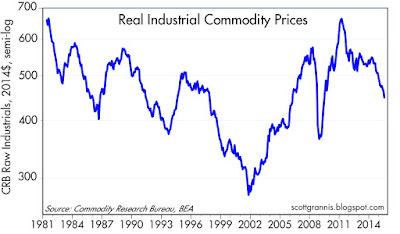 Note that commodity prices were relatively stable from 1980 through 2000, then they surged from 2001 to 2011. The chart above converts the index from nominal to real terms. Note that prices in the 1970s were volatile, but ended the decade relatively unchanged. Finally, the chart above compares the price of gold to the CRB Raw Industrials index. Note how closely they move, but also note how much more volatile gold prices are than most other commodity prices. Both are in a weakening trend. The market is still jittery. Stocks are off their recent highs, and it looks to be mainly due to falling oil prices, because they threaten the profits of the oil industry and they also increase the risk of bond defaults. But the positive side to this is lower expected inflation, and for consumers and businesses, lower energy costs. Bad for some, but probably good for most. The Vix/10-yr ratio has moved up a bit in recent days, and stocks have moved down, as the chart above shows. This inverse correlation is what I call "climbing walls of worry." Stocks fall because the market gets nervous, not because of any fundamental deterioration in the economic outlook. Once the worries pass, stocks move back up. Lower energy prices increase the risk of default on bonds issued by energy-related businesses. 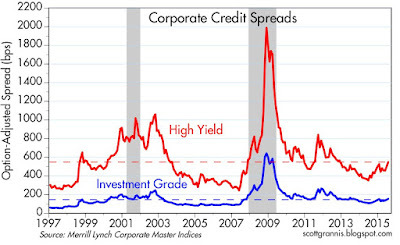 This can be seen in rising credit spreads for high-yield energy bonds in the above chart. The market undoubtedly worries that rising defaults in this sector could spread via "contagion" to other sectors. While it's not possible to rule out more widespread defaults, 2-year swap spreads today are trading at very normal levels, both here and in the Eurozone. At these levels, swap spreads are telling us that systemic risk is low and markets have plenty of liquidity. These are very important fundamentals that work to limit the contagion risk of the energy sector. One reason for the latest bout of market anxiety is falling oil prices, which today have almost returned to their low of last March. 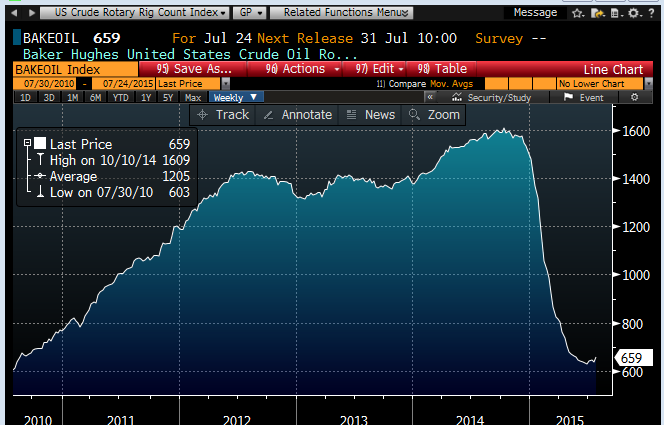 Crude oil today is less than half what it was a year ago. 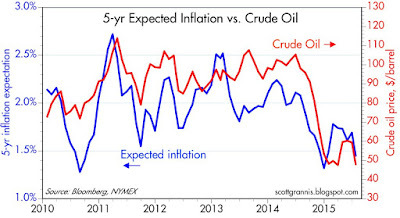 As the chart above suggests, the decline in oil prices has been closely matched by a corresponding decline in inflation expectations (blue line). 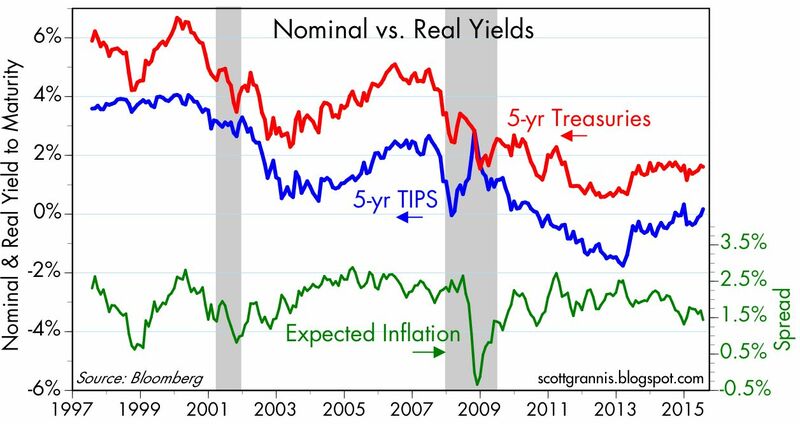 I've calculated those inflation expectations by subtracting the real yield on 5-yr TIPS from the nominal yield on 5-yr Treasuries. The chart above shows the data used for my calculation of inflation expectations. For the next 5 years, the bond market is expecting the CPI to average about 1.4% a year, which is near the low end of historical experience. 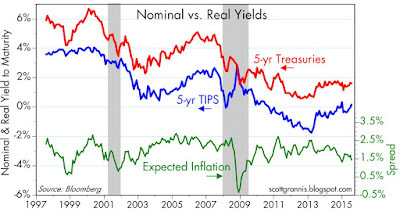 As inflation expectations have declined, the demand for TIPS has also declined; that is reflected in the rising yield on 5-yr TIPS (blue line in the above chart). And it's not surprising that the demand for gold has declined as well (red line). 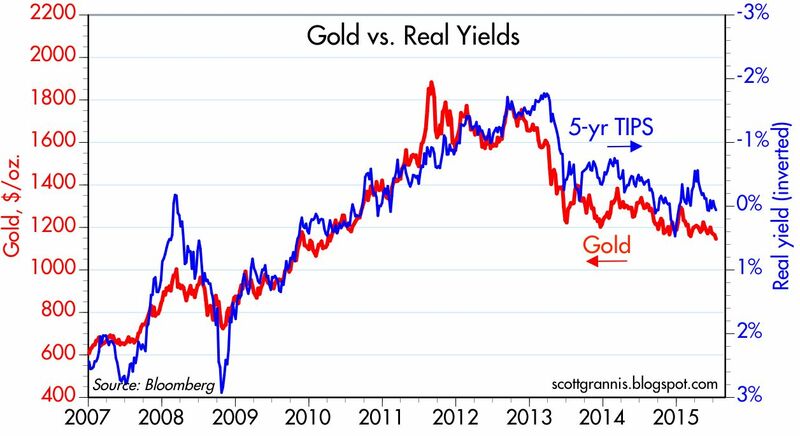 The prices of gold and TIPS (using the inverse of their real yield as a proxy for their price) have in fact moved together quite closely for the past 8 years or so. Inflation expectations and concerns have been in part responsible for this, especially in the past year, but another factor is at play as well: a gradual return of confidence in the outlook for economic growth and stability. I wrote in greater detail about the latter in a recent post, "Descending the Great Wall of Worry." No one can say for sure whether oil prices will continue to decline. The almost 60% decline in the past 10 months in the number of active drilling rigs in the U.S. suggests that U.S. oil supplies are going to be increasing at a much slower rate going forward. 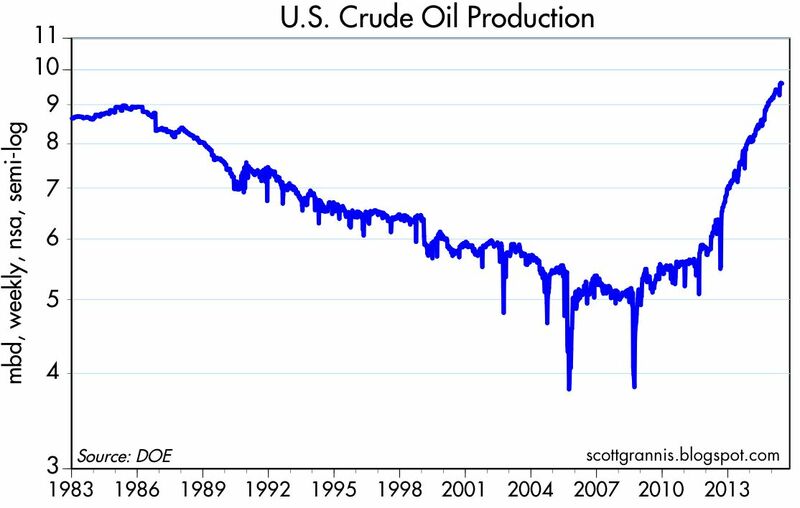 But if the deal with Iran goes through, Iran is going to be slowly ramping up its production over the next year at a time when OPEC is producing at fairly high levels. Meanwhile, it's reasonable to think that oil demand has increased, and in that regard I note that miles driven in the U.S. have increased almost 3% in the past year, whereas they were flat for the previous 10 years. Chinese growth has slowed down, but their oil consumption continues to rise at a relatively fast clip: per capita oil consumption in China rose over 30% in the past 5 years, according to the BP Statistical Review and IMF. In the meantime, sensitive market-based indicators of systemic risk (e.g., swap spreads) are not showing any signs of concern. This is a good sign that the latest bout of worries is likely to pass. 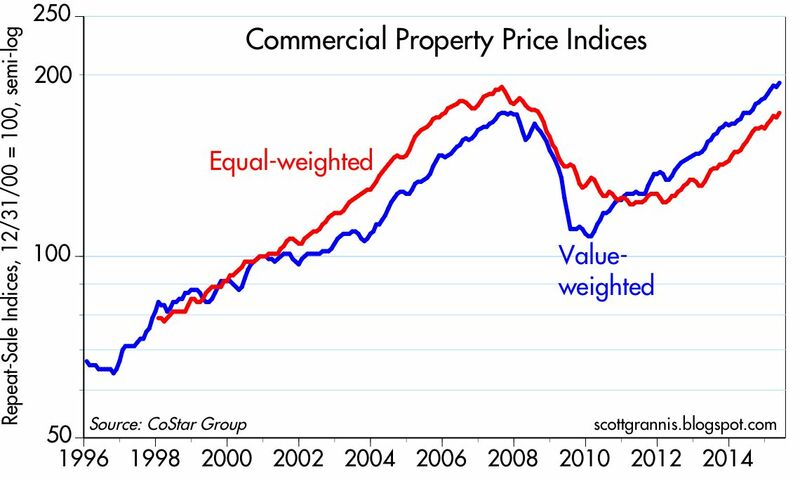 The commercial real estate market is doing very well, with prices of existing properties rising at strong double digit rates and a pickup in Architecture Billings pointing to stronger growth in commercial construction spending over the next year. 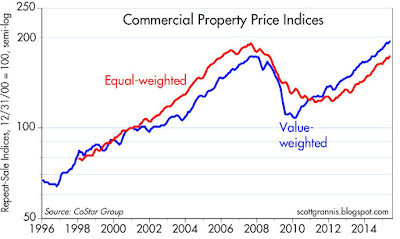 According to the CoStar Group activity in the commercial real estate market is very strong. Prices are rising at a 12-14% pace. Space absorption was the strongest in the current recovery. Leasing activity is robust. Investment activity is surging. This is a very strong indicator that the U.S. economy is doing just fine, and that growth could be picking up. 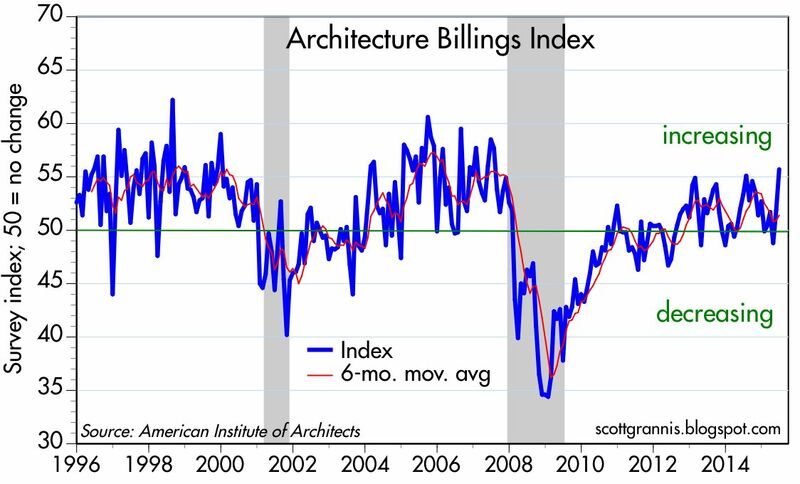 Architecture Billings are a good leading indicator of commercial construction activity, and the June reading was the strongest in the current recovery. See more details at Calculated Risk. For the past 100 years, gold prices have been all over the map: from a low of $17/oz. in 1931, to a high of $850 in 1980, to a low of $255 in 2001, then up to its recent high of $1900 in 2011, and today down to just under $1100. Gold has lost over 40% of its value in the past four years, and along the way, it has paid zero in the way of interest. As an investment, gold is not for the faint of heart. You can make or lose a fortune, depending on your entry and exit points. So is now a good time to buy gold? To help answer that question, I put together the chart above, which shows the real price of gold (using the CPI) over the past century. For the entire period, the average real price of gold was about $550/oz. 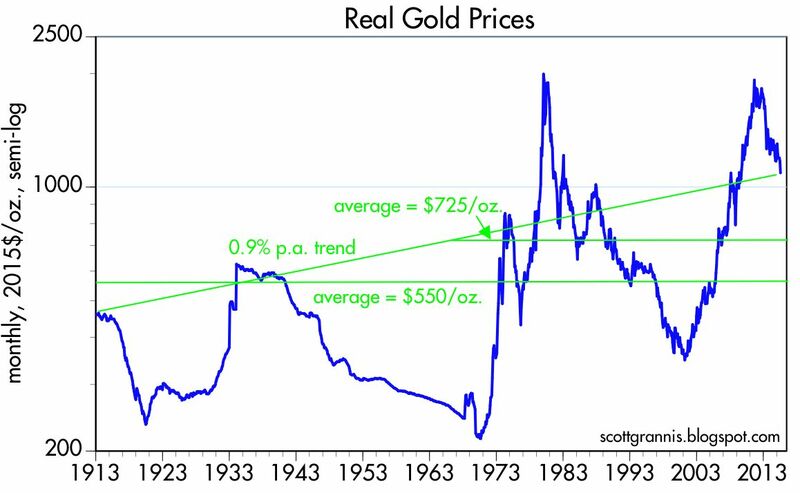 For the period beginning 1965 (when the Fed began cheating on the gold standard by not raising interest rates to counter gold outflows) through today, the average real price of gold was about $725/oz. The inflation-adjusted, compound annual rate of return to holding gold over the past 100 years is about 0.9%. Yes, gold is a store of value, but just barely, and only over very long periods. As a partial answer to my question, I think gold still looks expensive right now, because relative to the prices of other things, gold today is still significantly above its long-term average. Buying gold today means paying a premium. If history is any guide, it could well drop to $700 or maybe even $500 before embarking on another long rally. And in the meantime, an investment in gold yields nothing. For gold to pay off, I think it would take another huge scare: another big recession, a big and unexpected rise in inflation, another crisis of confidence in the world's central banks, or something that would make people think that The End of the World As We Know It is just around the corner. Barring another major scare of some sort, gold prices are likely to drift lower, possibly for years to come. Gold is now breaking down to multi-year lows, as the prices of 5-yr TIPS trend lower as well (the chart uses the inverse of their real yield as a proxy for their price). 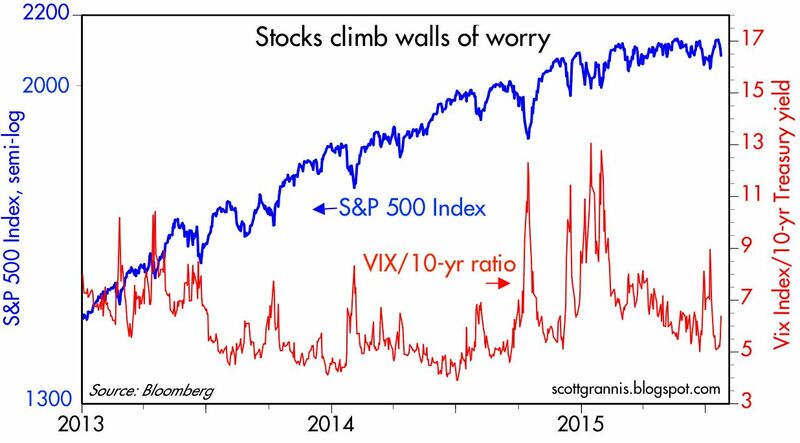 One of the other charts in last week's post was "Stocks climb walls of worry." I think the chart above represents one big wall of worry that the world is now descending. Global worries peaked with the PIIGS debt crisis in late 2011. Other contributing factors were concern about the weak dollar, Quantitative Easing, oil prices, and geopolitical concerns, to name a few. All those worries pushed up the prices of gold and TIPS because the world was desperate for safety. Now those worries are dialing down a bit, and investors are unwinding the "safety hedges" they put in place some years ago. It's not that confidence is surging, it's that pessimism and fear are declining. Gold is still about twice it's long-term average price in inflation-adjusted terms. 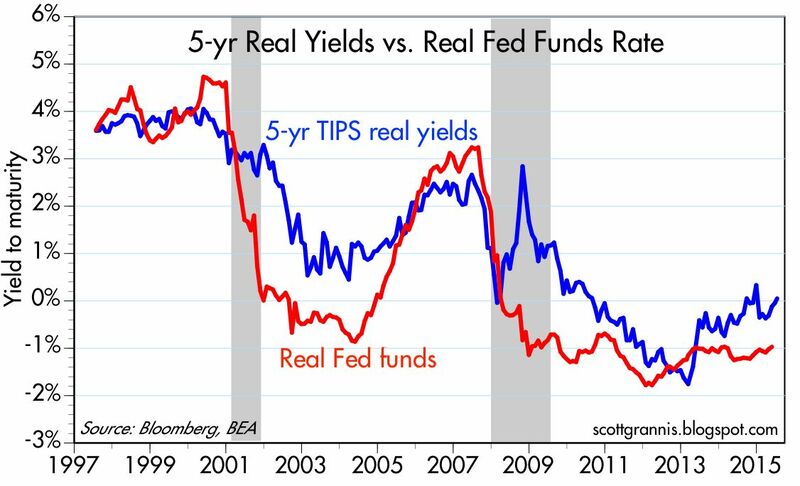 Real yields on 5-yr TIPS are still 125 bps below their long-term average yield of 1.4%, and almost 400 bps below their all-time high (which occurred in early 2000 when stocks were booming and the world thought the U.S. economy would grow 4-5% per year for as far as the eye could see). 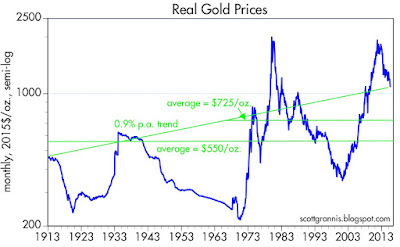 Gold and TIPS are still quite expensive from a long-term historical perspective. People are still willing to pay a premium for their safety, but that premium is declining. As I've been reporting for the past few months, inflation according to the CPI is running a solid 2%. June figures released today in fact suggest it might be picking up a bit. Huge swings in energy prices have made headline inflation statistics quite volatile in recent years. Taking out energy prices, however, reveals that inflation has been pretty steady at 2% per year for the past 15 ½ years, as the chart above shows. Over the past six months, the core (ex food and energy) rate of CPI inflation has actually risen at a 2.3% annualized pace. The headline rate has risen at a 1.3% annualized rate in the past six months and at a 3.5% annualized rate over the past three months. Absolutely no signs of deflation here—the real issue is whether we're in the early stages of an acceleration in inflation or not. Still too early to tell, but this bears watching. 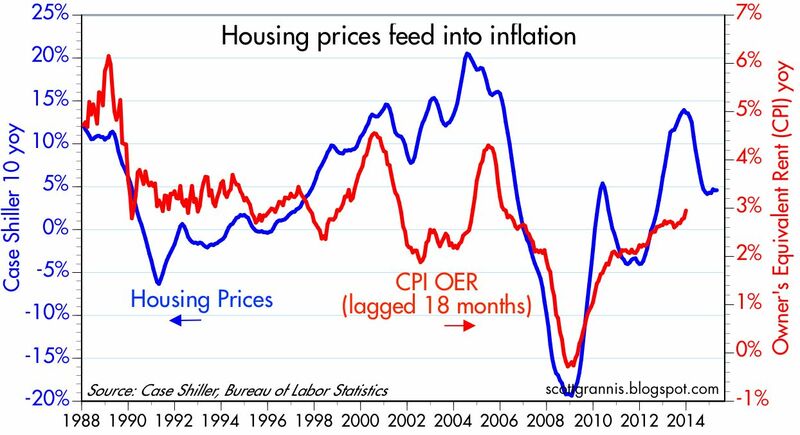 The chart above attempts to show that changes in housing prices can be an important driver of inflation with an 18-month lag. 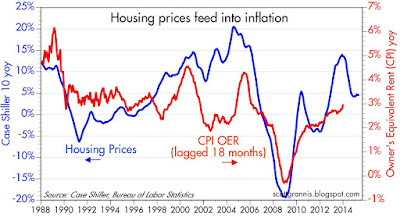 The blue line shows the year over year change in housing prices according to Case Shiller, while the red line shows the year over year change in the Owner's Equivalent Rent subcomponent of the CPI (which makes up about 25% of the total CPI). Rents by this measure are up almost 3% in the past year, reflecting the acceleration in housing prices in the past several years. Speaking of the housing market, today's June data for housing starts were much stronger than expected, and now show that the housing market has been quite strong this year. 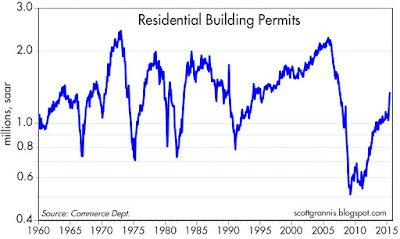 Building permits have been on fire of late, rising 30% over the past year! 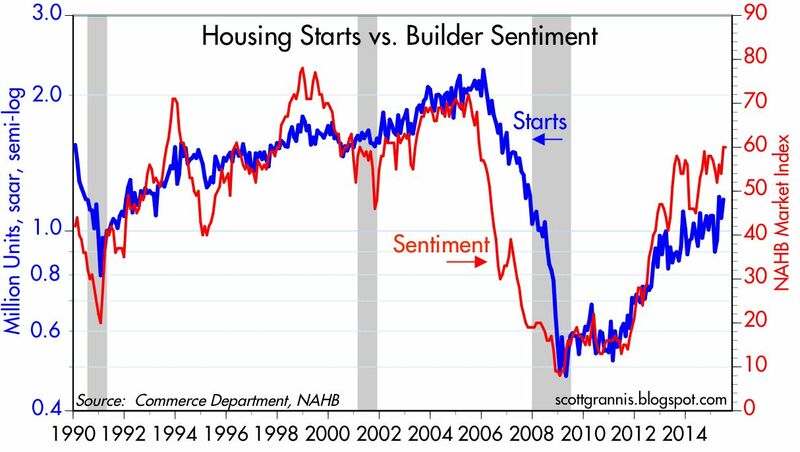 This, combined with the recent rise in homebuilder sentiment (see the preceding chart above), strongly suggests that housing starts will continue to rise in coming months. Inflation is alive and well, and so is the housing market. And, most likely, so is the U.S. economy. The Fed is absolutely justified in beginning to raise short-term interest rates, and the sooner the better, in my estimation. Here are a dozen interesting charts that I've been following rather closely of late, in no particular order. I've been featuring this chart on and off for the past several years. I find it fascinating that the prices of gold and 5-yr TIPS should be so well correlated for so long. (I'm using the inverse of the real yield on TIPS as a proxy for their price.) Both of these are what you might call "safe" assets: gold is a classic refuge from nasty things (e.g., inflation, currency debasement, geopolitical risks), and TIPS are not only default free but give you protection against inflation in addition to paying some interest (which gold doesn't). Both of their prices peaked around the time that the PIIGS crisis peaked—a time when the world was very afraid of another global financial market collapse. They have been falling for several years now, but both are still quite elevated from an historical perspective. I think this means that while the world's demand for safety has declined—and confidence is returning—investors are still concerned about things going wrong: e.g., China collapsing, the mid-East exploding, Russia advancing, a Grexit, and/or a breakup of the euro. 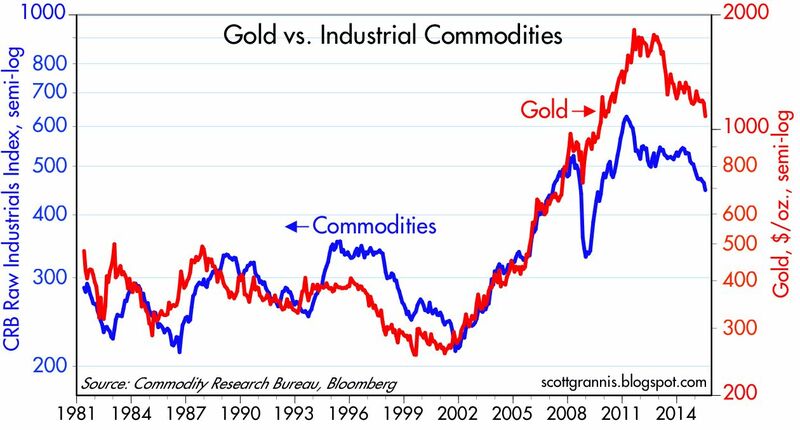 Not surprisingly, gold and commodity prices have been highly correlated for many years. Gold prices are a lot more volatile than commodity prices, however, as illustrated by the difference in scale of the y-axes: the gold axis is almost twice the range of the commodity axis. Both have been declining for the past several years, but both are still quite elevated relative to where they were in 2001. Commodities to some extent are an investment, like gold, that can protect against long-term inflation risks. So it makes sense that as inflation fears have eased, so have gold and commodity prices. But commodities also reflect the confluence of global growth dynamics and commodity supplies. Supplies surged in the wake of the huge surge in commodity prices in the early 2000s, and that, combined with a big global recession and weaker growth in Asian economies, has contributed to declining prices. But so far, nothing speaks to a collapse, serious weakness, or even deflation. The real yield on 5-yr TIPS has a lot to do with where the market thinks actual real yields on short-term interest rates will be in the future. That's important, because it's the inflation-adjusted Fed funds rate that is the Fed's true policy tool, not the nominal funds rate. 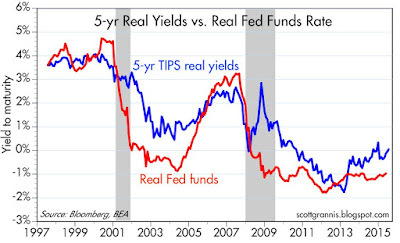 The real yield on 5-yr TIPS has been increasing for the past few years, a sure sign that the market is coming around to believe that the Fed will be raising rates (both in nominal and real terms) in coming years. The market will not be surprised or disappointed when the FOMC decides in coming months to raise the interest rate it pays on reserves. The only thing that could move the market at this point would be future hikes in interest rates that are more and faster than expected, or less and slower. Currently, the market is priced to a Fed funds rate of 1.25-1.50% in two years, according to Fed funds futures. The housing market continues to show signs of strength. 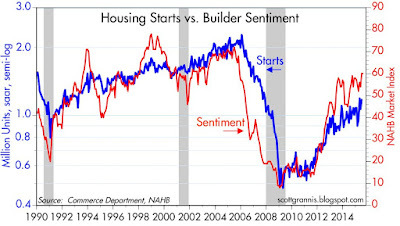 The index of homebuilders' sentiment suggests that housing starts are likely to increase over the next year or so. 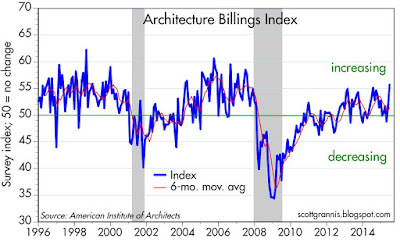 However, the index is still relatively low compared to where it was during the housing heydays. No sign of excessive optimism here. 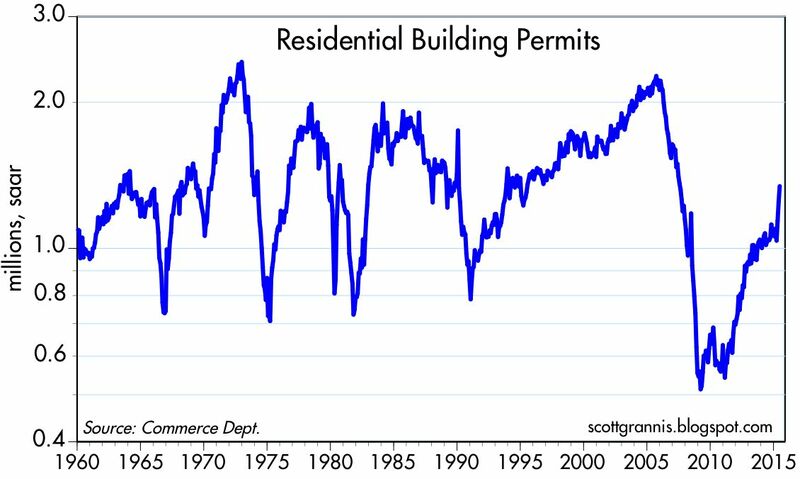 If anything, the chart above reflects housing starts that are going to be quite anemic relative to historic experience. The above chart suggests that this year's big decline in oil prices (red line) has been a significant factor boosting consumer confidence. 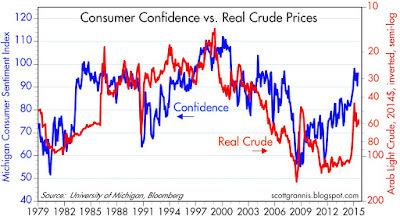 Confidence is still below its prior highs, however, and oil prices aren't exactly cheap at current levels. 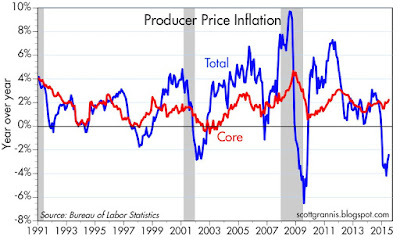 Oil prices have had a significant impact on inflation in the past decade or so, as the chart above shows. 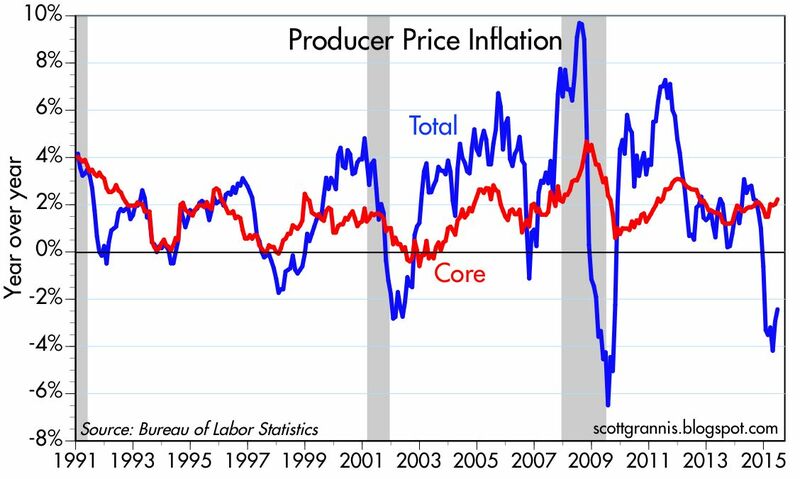 However, abstracting from food and energy prices (i.e., looking at "core" inflation), we see that inflation at the producer level is running at a solid 2%. No sign of deflation here. 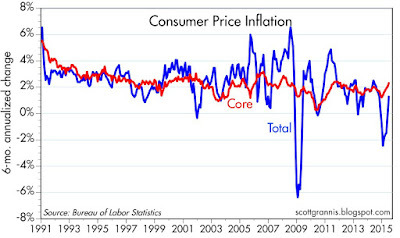 If anything, core inflation is somewhat higher now than it was in the 1990s. 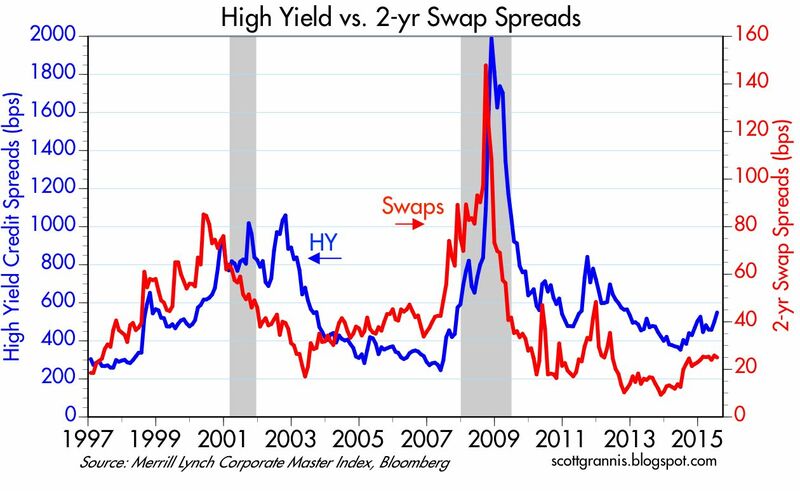 Swap spreads are a very important leading and coincident indicator of systemic risk. At current levels swap spreads are signaling that there is nothing wrong or threatening in the financial markets or in the economy. 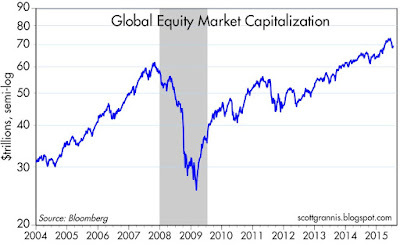 Liquidity is abundant, and risk aversion is more or less normal. Markets may get nervous from time to time, but as long as swap spreads are relatively low then nerves are unlikely to result in a weaker economy, and risk assets will continue to offer yields that are attractive relative to cash. 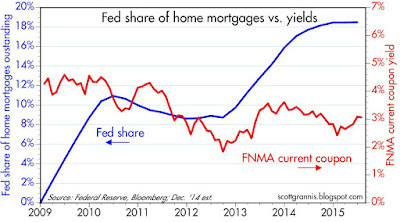 As the above charts show, the Fed holds about 18-20% of marketable Treasuries and outstanding mortgages. 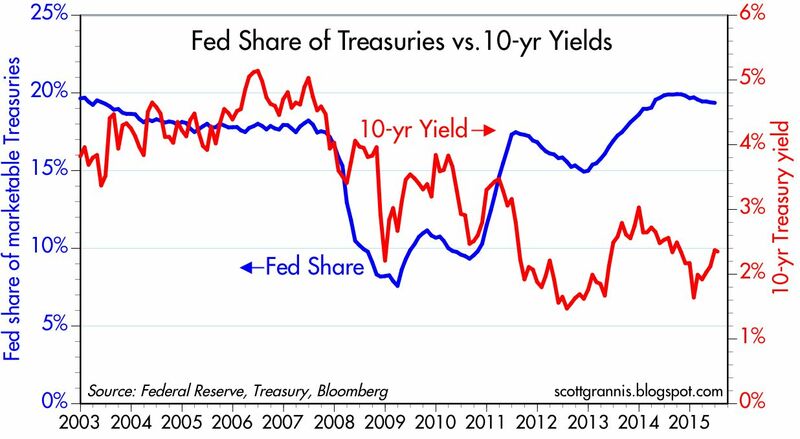 It's highly noteworthy that there does not appear to be any consistent correlation between the size of the Fed's holdings of these securities and the yield on those securities. This reinforces my belief that Quantitative Easing was never meant to be an attempt by the Fed to artificially depress bond yields. QE was all about swapping bank reserves for notes and bonds in an effort to satisfy the world's demand for safe, short-term securities; in other words, to accommodate the world's huge demand for money. The ratio of the Vix index (the implied volatility of equity options) to the 10-yr Treasury yield is a good proxy, I believe, for the market's fears, uncertainty, and doubt. There's been a lot of that, off and on, in recent years, and each bout of FUD has seen an equal and opposite reaction in stock prices. 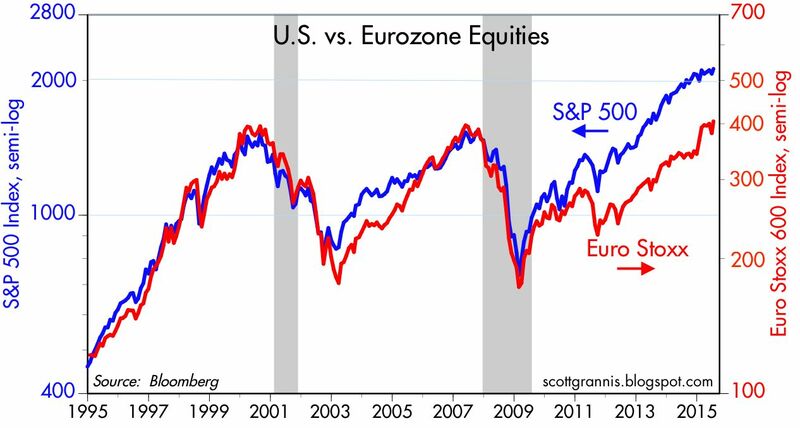 Once fears recede, stock prices go back to their slowly rising trend. When the market is continually climbs "walls of worry" that is healthy, since it means the market is still fundamentally cautious and not overly exuberant. 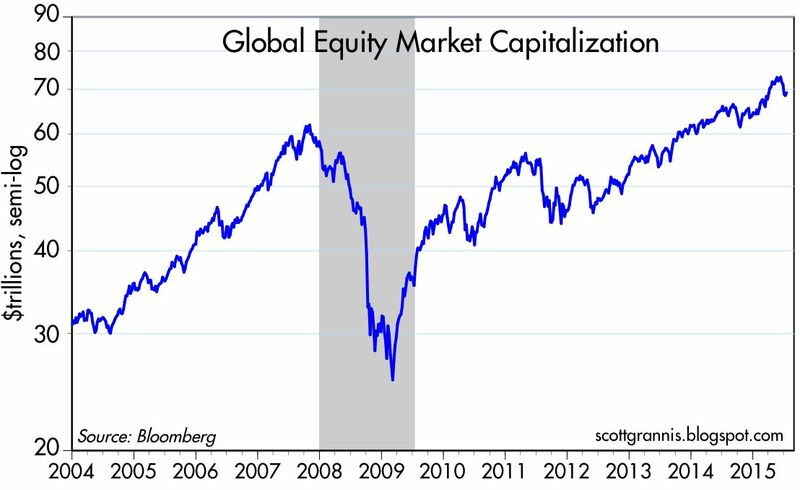 Global stock markets have been in rally mode for over six years, but prices today are not significantly higher than they were in 2000. In real terms, the S&P 500 is only about 2% higher today than it was at its 2000 peak. The magnitude of the destruction of wealth that occurred from 2007 through early 2009 (in dollar terms, global equity values fell by almost 60% from their 2007 high to their 2009 low—a staggering loss of $37 trillion) is still very much in investors' minds these days. Once burned, twice shy, goes the saying, and that massive loss goes a long way to explaining why markets today are still somewhat cautious. This post is a followup to yesterday's post, in which I noted the dramatic reduction in the federal budget deficit, which is now only about 2.2% of GDP. 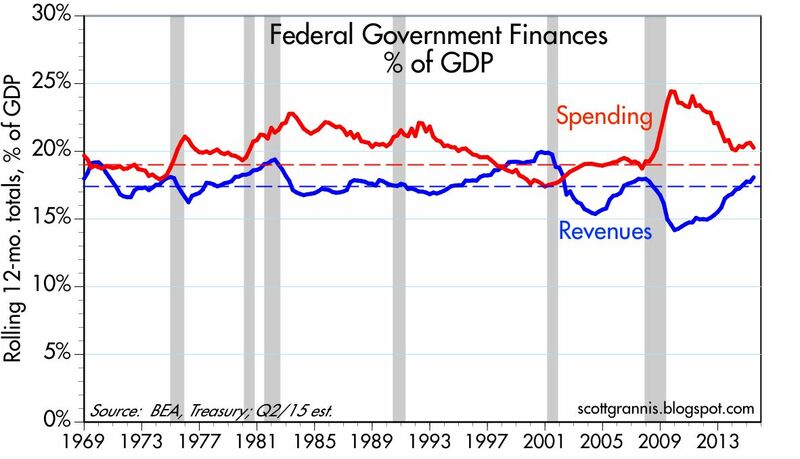 Thanks to this, and given that the growth of debt outstanding (3.6% in the past year) is now less than the growth of nominal GDP, which is probably rising about 4% per year, the burden of our federal debt (i.e., debt outstanding as a percent of GDP) has stopped rising. 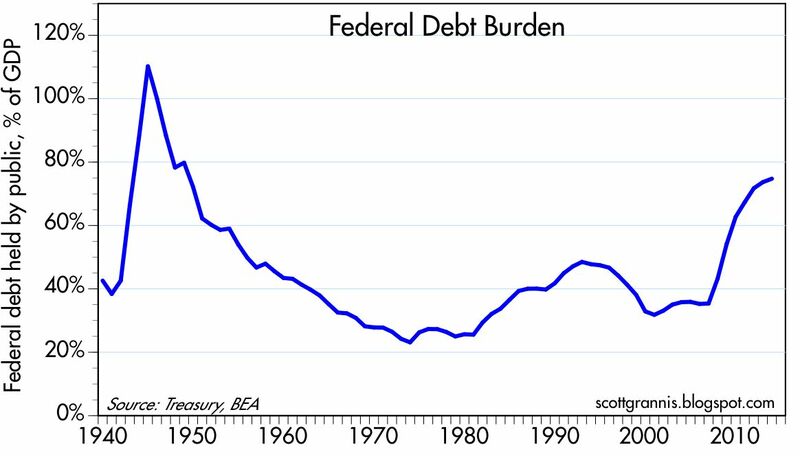 If current trends continue, the federal debt burden is unlikely to rise further and could even decline marginally, to roughly 72%, between now and the end of the Obama administration in early 2017. The bad news is that our debt burden has doubled in the past seven years, and that has never happened before during peacetime. 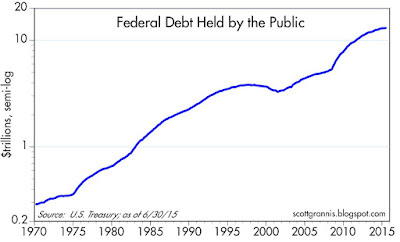 The chart above shows the nominal level of federal debt held by the public, currently $13.1 trillion (this includes the Fed's holdings of $2.5 trillion of Treasury debt). Total public debt outstanding currently is $18.2 trillion, but that figure includes intergovernmental holdings of $5.1 trillion, which is mostly debt that the government "owes" to the Social Security system. For many years, the federal government has used Social Security surpluses as if they were general revenues, spending the money and maintaining the fiction that it was borrowed. 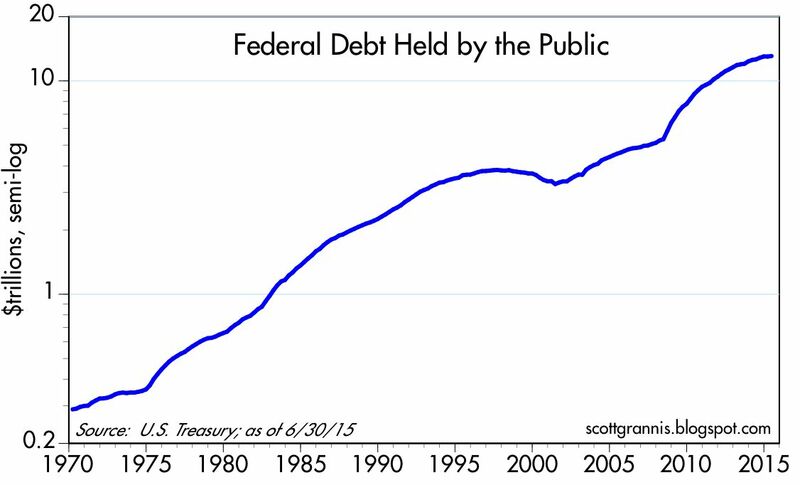 The chart above shows the burden of federal debt that is owed to the public, which is simply debt outstanding divided by nominal GDP. That is the best measure of how onerous our debt burden is. The current level of federal debt outstanding is about 73% of GDP, which is roughly equivalent to saying it would take about nine months of everyone's work to pay off the debt. The chart above takes changes in the federal debt burden over time and assigns them to presidential administrations beginning with Nixon. The red bars indicate increases in the debt burden, while green bars represent periods in which the debt burden fell. Note that the increase in the country's debt burden during the Obama presidency has to date been about 26 percentage points, almost as much as the net debt burden accumulated by all presidents prior to Nixon (29 percentage points). 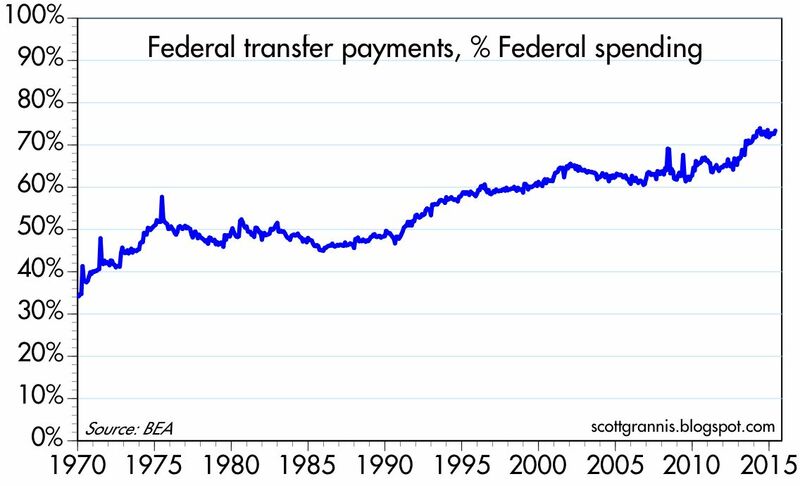 As the chart above shows, almost three-fourths of all the money spent by the federal government is now in the form of transfer payments—that is, taking money from those who work and giving it to those who don't work. In the year ending last May, the federal government sent out checks totaling over $2.6 trillion to people who were "entitled" to the money for various reasons (e.g., they were retired, they received food stamps, welfare, disability insurance, etc. ), meaning they did nothing in exchange. 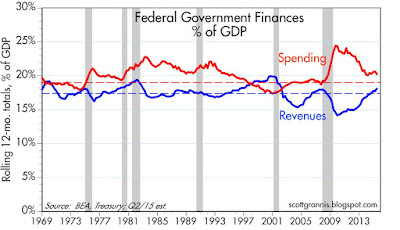 Very little of what the federal government spends goes to productive investments. 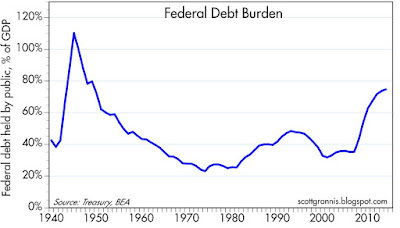 Since most of the money our government borrows does nothing to enhance the underlying strength of the economy (supporting consumption does nothing to grow the economy), our federal debt burden is a serious and a significant fraction of GDP. Servicing that debt currently requires only about 2% of GDP per year, but that will rise as interest rates rise and it could become quite problematic at some point. The cost to the federal government of rising interest rates will be mitigated substantially, however, since Treasury has for years been extending the maturity of its outstanding debt. 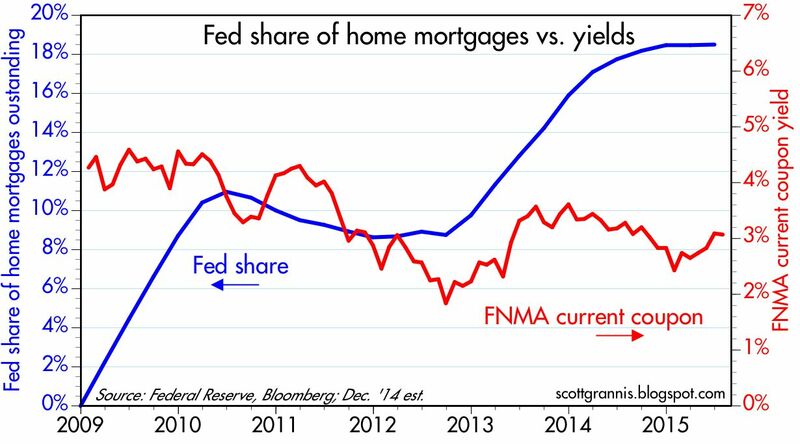 This has "locked in" historically low borrowing costs for quite some time. 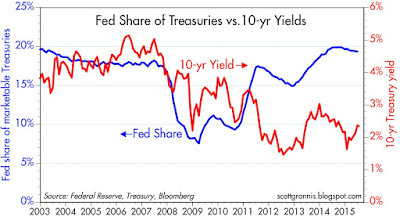 It's a zero-sum game, however, since whatever Treasury saves by having borrowed a low, fixed rates, the holders of Treasury debt will lose as rates rise. Rising inflation—which would almost certainly cause interest rates to rise even more—could "bail out" the government by reducing the real burden of the debt, but again at the expense of the public. As a counterweight to the sizable burden of public debt, I note that household debt service burdens are historically low, and household leverage has fallen significantly in recent years. At least for now it looks like the federal debt situation won't get any worse. Before too long, however, things could get ugly unless there is some serious effort to reform entitlement programs. The best long-term solution would be to restrain the growth of spending, reform entitlements (e.g., raise the social security retirement age, adjust the indexation formula, and means-test benefits) and adopt policies (e.g., lower marginal tax rates, lower regulatory burdens) that increase the private sector's incentive to work and invest, thereby causing the economy to grow faster and thus reducing the burden of debt. It's my hope that, with social issues now largely off the table, and with federal deficits back down to manageable levels, the debate leading up to next year's elections will focus the electorate's attention on sensible, growth-oriented policy solutions. As the economy celebrates six years of recovery, we should all celebrate the massive decline in the federal deficit. It's good news for the future, because the expected future burden of taxation has declined significantly, and because we've now proved that Keynesian economic theory doesn't work—the deficit collapsed but the economy didn't. The magical solution was growth, not government spending, and that should help steer the course of future fiscal policy in a more growth-friendly direction: less reliance on government stimulus and more reliance on increasing the after-tax rewards to work and risk-taking. The recovery is now six years old. During that time, 12-mo. federal revenues have increased 47% (from $2.18 to $3.21 trillion) and federal spending has increased only 6% (from $3.43 to $3.64 trillion). With spending held relatively steady while the economy grew, spending relative to GDP has declined from a high of 24.4% of GDP to 20.3%. That's only about 1 percentage point above its post-war average of 20.3%. Meanwhile, revenue growth has far outpaced overall economic growth (as it usually does during recoveries), with the result that revenue relative to GDP has risen from a low of 14.2% of GDP to 18.1%. That's a little less than 1 percentage point above its post-war average. 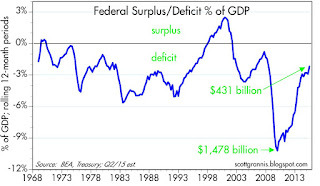 The happy result of all this is a sharply lower federal deficit. 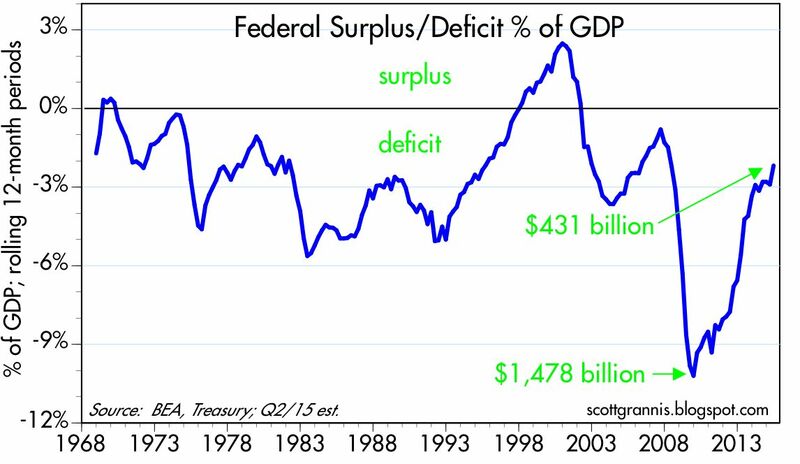 In the past 12 months, the federal deficit was $431 billion, only 2.2% of GDP. The decline in the deficit from a high of 10.2% to today's 2.2% is unprecedented in post-war history. If any Keynesian economist at the end of 2009 been asked to predict what would happen to the economy if the deficit were to fall by 8 percentage points over the next 5 ½ years, he or she would have predicted disastrous growth, and most likely another recession. There's a huge lesson here: just as the biggest jump in the deficit in the modern era—fueled by emergency spending—failed to stimulate the economy, the huge decline in the deficit failed to crush the economy. The economy has been growing at 2-2.5% on average per year for the past six years, despite massive swings in the deficit. Keynesian theory thus been totally discredited. There is no reason to raise tax rates, and there is no reason to try to "stimulate" the economy by increased federal spending. The private sector, left to its own devices and given greater breathing room as the result of a shrinking public sector, is perfectly capable of generating jobs and delivering higher living standards for everyone in the coming years.